The structure of learning the modules was ideal to fit into my hectic life. Many thanks to Faith and all at Hypnotic World. The structure of learning the modules was ideal to fit into my hectic life. I attended various workshops put on by Hypnotic World and I've considered them to be a must in my training. I'm really excited to be able to help future clients with their problems. As a keen surfer the peace and happiness I find in surfing I'm sure I will find in Hypnotherapy. Waves of positive energy to you all. I've really enjoyed studying with Hypnotic World. I enjoyed working at my own pace alongside my job. I thought the course was extremely well set, and paced throughout the modules. I enjoyed working at my own pace alongside my job. The fact there were no deadlines was great for me again with working full time... Faith was fantastic at marking and always got back to us in no time and was always there to ask advice. I would love to do another course through Hypnotic World if it were to arise one day. 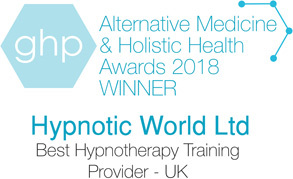 I was so happy to discover Hypnotic World not just because of studying remotely in my own time but the fact that it is affordable and the support is outstanding. I am excited to have passed and look forward to taking the next steps to start practising and helping people again. In the meantime I highly recommend the course and workshops to anyone considering learning hypnosis. Please see below for Professional Hypnotherapy Course registration and pricing information. Questions? We are here to help - telephone, email or write to us here. Existing student? Sign In to order your next course module. Prices include P&P and exam costs. Practical tuition is optional and can be taken after Module 5. Rates vary between providers and locations. See Practical Tuition for pricing. How will I receive the modules? Modules are provided as ring-bound books and are usually dispatched within 24 hours. If you prefer to receive printed materials in Adobe Acrobat (PDF) format, please email support@hypnoticworld.com upon enrolling to obtain modules via email. Is there an enrolment deadline? No. 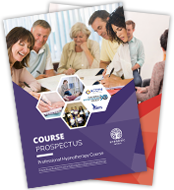 As the Professional Hypnotherapy Course is distance learning, students can enrol at any time and complete the modular training at their own pace. What accreditations/quality checks does the course have? The Professional Hypnotherapy Course has been accredited by ACCPH (Accredited Counsellors, Coaches, Psychotherapists and Hypnotherapists). The course has also been quality checked by the National Hypnotherapy Society, currently the only hypnotherapy organization whose register is accredited by the Professional Standards Authority. Upon successful completion of the final exam, you will receive a Diploma in Hypnotherapy and the designatory letters DHP Acc. Hyp. Will I receive practical training on the course? Practical training is an optional component of the course and enables students to practise the skills that they have acquired in the modules, as well as gain confidence to treat future clients. Practical training takes place with one-to-one trainers in 15+ UK locations and at our regular workshops, and can be arranged by contacting us once you have completed Module 5, at which point students will have gained sufficient theoretical knowledge to practise at the workshops or one-to-one practical training sessions. Rates vary between providers and locations - for further information on practical training and pricing, click here. Yes - we offer a full training satisfaction guarantee. You are welcome to enrol on Course Module 1 and if for any reason you feel that our training isn't for you, you can return the module for a full refund. Refer to the Student Testimonials page for case studies of graduates of the course. For further information, please refer to the Course FAQ, Course Area and Course Contents. You can also contact us with queries on 0800 678 5617 or Email Us. "The business I am just setting up will be all the richer for having taken the chance and ordered this excellent course." "It's been hard work, but incredibly satisfying, and it was Hypnotic World that started it all off for me! A HUGE thank you!" "The Modules are well written in an easy to understand manner, one that makes it interesting for the reader to learn from." "Since receiving my certificate in January I have gone from strength to strength." Registered with the UK Register of Learning Providers (no. 10021885).